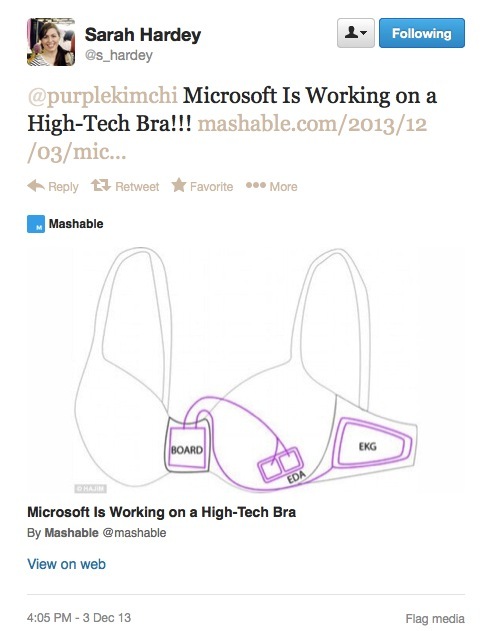 Earlier this week, Twitter user @s_hardey tweeted at me that Microsoft is working on a high-tech bra. The tweet came on a Tuesday, which is my busiest teaching day. Before I got a chance to check it out, it got buried in my mentions. But today…today is an unexpected work-at-home day thanks to winter storm Cleon. So when I saw this PolicyMic article in my Tweet stream, it reminded me that I had never followed up on Sarah’s tweet and gave me the chance to check it out. Microsoft Has Invented a Bra That Discourages Women From “Emotional Eating” – PolicyMic. Nina Ippolito is responding to a research team’s project that used a phone app to track the relationship between women’s emotions and eating habits and then tried to use the app to intervene before emotional eating could occur. The intervention came in the form of a message that suggested deep breathing exercises. The third stage of the project developed a prototype bra that tracked the emotional state of the wearer based on vital signs. The data gathered by the bra did not result in an intervention. Instead, the purpose was to see how well the vital signs aligned with emotional state. The paper does not seem to indicate how the bra might eventually be connected to a strategy of intervention. Would it buzz? Shock? Connect to the wearer’s phone and the app? It’s unclear. Ippolito’s critique of the Emotional Eating bra raises many interesting questions. Like Ippolito, I find myself hesitant about the researchers’ choice of which women’s health problem to solve. I suspect that emotional overeating is a problem for which the researchers felt that their wearable device presents a plausible solution. However, the device has problematic potential for policing women’s emotions and bodies in a culture that is already quite adept at doing so.